germuska and I had the pretty ridiculous luck of stuffing ourselves silly at The Purple Pig tonight. We were on our way out of downtown for dinner when we noticed lights on in The Purple Pig space. The gate to the Illinois entrance was locked with a cable, but porky instincts led us to the main entrance of the 500 N. Michigan building. We asked the receptionist if there would be another entrance to the restaurant, and she told us to make our way down the hall. We opened the Purple Pig door to a family and friends soft opening, but we were made to feel very welcome so we stayed. Gluttony ensued. - Salt-roasted beets with whipped goat cheese and pistachio vinaigrette. These were fine but nothing special. It seemed at first like I was eating just plain roasted beets. That's because I was. It took me a few pieces of beet from the top and middle of the mound to figure out that the goat cheese was only smeared on the bottom and sides of the bowl. Strange. I don't know what "The Purple Pig Platter" on the menu consists of, but our spread tonight included coppa, finocchiona salami, Jamon Serrano, lingua agrodolce, Catalonian fuet and Berkshire pig testa, all made in-house except the Serrano and fuet. 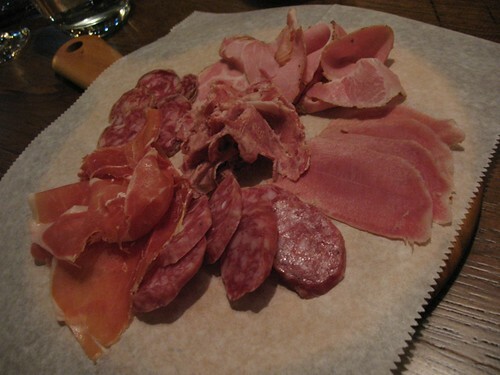 I was pretty happy with all of it though I would have liked at least one salume with some heat. The testa was outstanding. We also had pig tails braised in balsamic, which were very tender but too sweet for me. We were very full by the time Bannos, Sr., offered us dessert. I can't remember what the other options were, but I do remember that one can get the house soft serve sandwiched between slices of brioche. We opted for straight tastings. We ordered maybe four of these dishes. The rest were sent out by the kitchen and Bannos, Sr. We were told when we sat down that wine was on the house, so we enjoyed several glasses each of some Cava and Rioja. The entire meal was comp'ed. Very piggy luck. Given the quality of the food, prices seem pretty reasonable though. I look forward to returning, especially to try the various pork neck and marrow items. The official opening of The Purple Pig is today (Wednesday). They're open everyday from 5:30 to midnight and will begin serving lunch in late January. It seemed like they were still waiting for wines to come in (the wall of wines wasn't stocked), and Bannos, Sr., mentioned that they plan to make full use of the patio on the Illinois side of the building once warmer weather arrives. great pic's , i'll put on my list of place to try out . philw wrote: great pic's , i'll put on my list of place to try out . also a nice spot in food sec. today's trib. happy_stomach wrote: The testa was outstanding. I continue to find it interesting how a preparation with the same name can be so different at various places in Chicago. This testa had more winter spice than most, more soft lusciousness, less textural contrast, and had a strange-to-me bright red color in places, as if parts of it had been cured using nitrates. If The Purple Pig succeeds, it will mark the pinnacle of Chicago's end of squeamishness/ rise of whole animal cooking. I joined a group of Mag Mile shoppers and after-work imbibers chowing down on crispy pig ears, neck gravy, marrow, lardo crostini, head cheese, real milk braised pork, and pig tails. How was it all? I'm not sure yet, as I was in such shock that this hidden place could draw such a happy crowd in this location. I enjoyed myself, but will have to go back to decide whether the food's any good. What I will say is that it was cheap, and the portions were huge. More shock. And I really liked The Purple Pig. I tweeted about it before him, so my words will carry more weight. Kennyz wrote: I tweeted about it before him, so my words will carry more weight. I have not tweeted about PP, but I weigh more than most. Wow, what fortune! I'm jealous of your serendipitous find! Ignore the posted hours on The Purple Pig website, and call first if you're thinking about going during non-dinner hours. And to restaurants that can't be bothered to put accurate information on their websites, at least for something like your business hours: F-You! Take the stupid site down if it's too much work. I'll echo Kennyz's statement, if not the tone. I tried to go to TPP for lunch on Friday 1/8 and was informed by the building's front desk person that they were not open for lunch, but that they plan to serve lunch next week. Kennyz wrote: If The Purple Pig succeeds, it will mark the pinnacle of Chicago's end of squeamishness/ rise of whole animal cooking. I joined a group of Mag Mile shoppers and after-work imbibers chowing down on crispy pig ears, neck gravy, marrow, lardo crostini, head cheese, real milk braised pork, and pig tails. How was it all? I'm not sure yet, as I was in such shock that this hidden place could draw such a happy crowd in this location. I enjoyed myself, but will have to go back to decide whether the food's any good. Oh, I think Chicago is done being squeamish, if the people around us were any indication: the real question is, "How's it gonna play in ____ [insert other Rust Belt city here]?" Given the muscle behind this place, you have to figure they're going to clone it--and how. We had a mixed but promising meal. The pork shoulder Kenny mentioned is really beautiful, but it's rather inexplicably served amidst mashed potatoes and gravy (definitely not noted on the menu)--a piece of pork this good is a terrible thing to waste on a dish that looked straight from Stouffer's. The neckbone gravy under the "schmears" column--which somewhat oddly collects everything from pates to caponatas--was rugged and rich and surprisingly excellent, but it's being presented in a pretty pedestrian standard, with some very average ricotta and toast points. It needs a better stage. The gravy is telling, because for all the restaurant's Kahan-esque qualities, the flavor profile of what we ordered was very Harlem Avenue-y: lots of herbs, salt, and olive oil. Like Kenny, I was surprised by how assertive the flavors were--though I suspect in ten years we'll see PP the same way we view Maggiano's now--but felt they were out of balance in several of the dishes: rosemary and salt overwhelmed the cuttlefish, the fried brussel sprouts took a thyme bath, and so on. 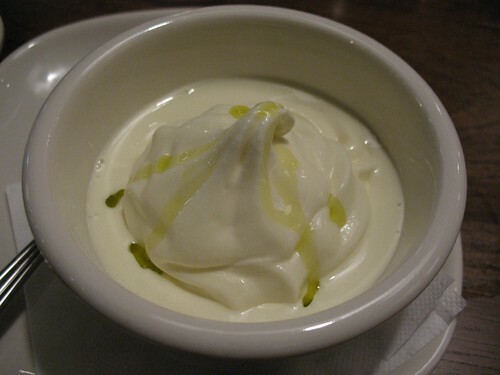 I thought the olive oil soft-serve tasted more like the wooden stick holding an ice cream bar than a dairy product. It took the Publican some time to get its wings; I'll be curious to see if and when the Purple Pig does. 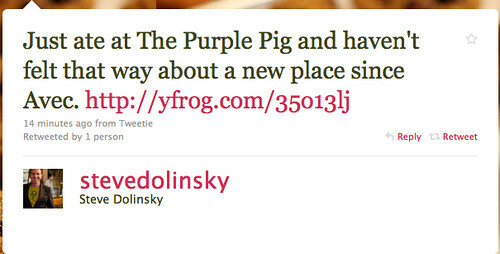 That's a terrific writeup on your blog, and I share a lot of your sentiments about The Purple Pig. Except one. I don't want them to do a damn thing different with the neck gravy. That stuff was so phenomenally good, and I thought the average ricotta or whatever and the basic toast points let the star be the star in just the right way. Kennyz wrote: I don't want them to do a damn thing different with the neck gravy. That stuff was so phenomenally good, and I thought the average ricotta or whatever and the basic toast points let the star be the star in just the right way. Yeah, I'm talking out both sides of my mouth: I wouldn't know what else to do with it, either...but it felt like it deserved more than your typical "baked goat cheese"-style tapas dish. Because that was an excellent, excellent gravy. The roasted bone marrow and salad is straight out of Fergus Henderson's Nose to Tail Eating cookbook. You may remember it as Bourdain's death row meal from episodes such as London. The marrow definitely could've used more time in the oven, though. Its center was still solid and barely touched by heat, resulting in a tasteless white mass akin to shortening. They may be a bit paranoid about turning it into a pool of grease. I like my marrow jiggly and shimmering, not stiff and waxy. Does anyone else think the bread for the smears is way too charred? Every single slice that went out seemed to have a uniformly blackened crust. I also thought the bread was way too light and airy for the smears. Some slices were 50% holes. I couldn't help but long for something more dense and substantial, especially for the pork neck rillette and mostarda. The rillette and mostarda smear was fantastic, by the way. I thought it was all about the mostarda (Cremonese? ), with the rillette giving each bite a subdued meaty and savory finish. Had dinner at The Purple Pig last night, and overall am looking forward to going back to try some of the items we missed. We started with the Shaved Brussel Sprouts with Pecorino Noce & Parmigiano reggiano antipasto. The ratio of ingredients leaned very, very heavily toward the cheeses, which I was fine with. My wife was a bit bummed, however, as she was hoping that the brussels sprouts would've been the star of the show. Next came the Roasted Bone Marrow with Herbs, which we both really enjoyed. It sounds like the bones we received were better-roasted than the ones kanin had - they both had nice brown crusts covering luscious, hot, easily-spread marrow. The herbs (flat parsley, cilantro & thinly-sliced onion) and sea salt were nice, mellow accompaniments. I thought the flavor of the toast pieces, with the nice char, was fantastic...however, I do agree that some of them were way too "holey" to be properly "smeared". The next dish to arrive was the Octopus with acini di pepe & Swiss Chard. The pasta and chard were well-cooked but not all that memorable. The octopus, however, was extremely salty and somewhat overcooked. One large tentacle wasn't bad, but two smaller tentacles and the one piece of the body were dry, a bit tough, and tongue-burningly salty. After this we had the Calabro Ricotta with Pork Neck Bone Gravy, which was fantastic. We both thought it could've benefited from a little more salt, but this was a minor quibble. The pork was tender, porky, fatty, and rich. The ricotta was bland, sure, but when "smeared" (the word still makes my inner 11-year-old giggle) together with the gravy on the toast, it added a nice, creamy texture. Finally, for dessert: Butterscotch Budino (a.k.a. butterscotch pudding), topped with either crème fraiche or whipped cream, not sure which. Either way, it took a lot of willpower to not lick the bowl - I have a weakness for butterscotch pudding, and this stuff was damn good. The soft serve ice creams, on the other hand, weren't anything to write home about. 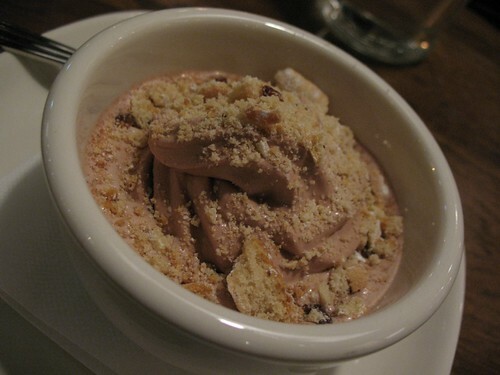 The gianduja (fancy Italian word for "Nutella", apparently) was tasty enough, but the olive oil was a bit disappointing; we were expecting a noticeably fruity olive oil flavor, but instead got so-so vanilla soft serve topped with a few drops of olive oil and a few grains of sea salt. We went with brioche rather than cup, so our ice creams came in a split-top brioche bun, which was unmemorable on its own. The draft beer I had with my meal, Baladin Nora, is now in the #1 spot on my must-buy list. It sounds odd, but its nose and taste were strongly reminiscent of temple incense. This was a unique, smooth, really fantastic beer. A bit pricey ($12 for a goblet-full), but I won't hesitate to order it again. The staff members were friendly, helpful, and seemed genuinely interested in getting feedback on dishes. On top of that, I liked the atmosphere a lot - I thought the room had a fun, energetic vibe to it, but felt warm & cozy. I liked the staff, atmosphere, and adventurous (for its location) menu (and the fact that it's really conveniently located for me) enough that the complaints we had about the dishes are easy to write off as symptoms of working out the kinks. I'll happily head back there at the next opportunity. Incidentally, one of the gentlemen behind the bar (I got the impression that he's a manager or owner or something, he referred to himself as "the guy with the funny accent") said lunch service will begin this Monday (January 18). We had an incredibly enjoyable meal at The Purple Pig last night. The wife immediately declared it one of her favorite restaurants in Chicago. We had a couple of smears, a couple of fried items, and the prawns from the "a la plancha" portion of the menu. For smears we had the bone marrow and the mortadella. The bone marrow was perfectly roasted. Rich and wonderfully gelatinous, it was perfect on slightly charred bread with a sprinkle of salt and some greens (why more restaurants aren't serving this I have no idea). I also enjoyed the mortadella (spreadable bologna! ), but probably not as much as the bone marrow. That's not really intended to be a knock on the mortadella, I just really like roasted bone marrow. From the fried items section of the menu we had the fried deviled eggs and the prosciutto bread balls. The deviled eggs, it seems, are much improved from the version that happy_stomach had in her post. The fried layer was thin and crisp, the white was firm, and the inner chamber was filled with hot creamy goodness (that one's for G Wiv). 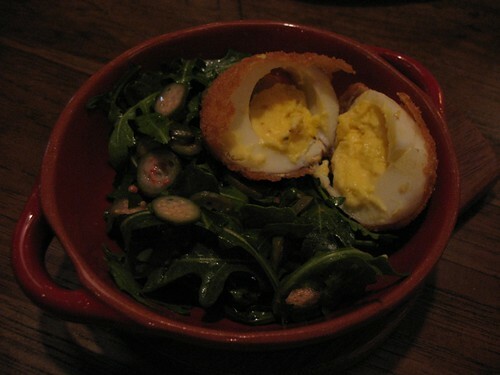 Deviled eggs have become a bit of a fad over the last couple of years, but this version was truly a standout. The prosciutto bread balls looked and tasted like little arancini and were served in a very thin pool of tomato sauce. From the look of them, it looked like they were just going to taste like generic fried food product. However, the first bite was filled with the perfectly balanced tastes of the prosciutto, whatever else was holding the ball together, and the nice light tomato sauce. Another great dish. We had the prawns from the plancha. This dish was probably the least successful of everything we ate, but I give the restaurant serious props for serving shell-on/head-on shrimp within spitting distance of Bandera. Dessert was the Sicilian Iris. Absolutely brilliant. Basically a big, freshly fried donut filled with ricotta and chocolate chips. I even convinced my chocolate hating wife to take a bite and she enjoyed it. The Purple Pig is a phenomenal addition to the Chicago dining scene, and an even more welcome addition to the area around Michigan Ave. I will absolutely, positively be back...many, many times. FB page says it is. I also saw a blog review that stated they were there during lunch. So, knowing that we didn't want to eat too early and that PP would likely be packed to the gills, we decided to put our names in around 7:15, knowing that we wanted to come back around 9:00ish and intending to spend the interim at Eno's across the street in the Hotel Intercontinental. At 7:15 they were, indeed, packed. The hostess told me it would be an hour-hour and a half--I said no problem but that we didn't want to try to fight the crowd (no room at the bar or behind it) and would it be ok if we went to Eno's across the street. She looked at her counterpart and shrugged. I said can you take my phone number and call us when it was time to come over. She again looked at her counterpart who shook her head. OK. So I took their number and asked counterpart if I could call around 8:30 and get a yay/nay to come on over. She said OK. Knowing that they are new and obviously slammed, I wasn't going to worry about the less-than-enthusiastic efforts to work with us. Called over at 8:20--said that it would be another hour and half because we weren't there when the table was ready! Obviously less than thrilled now, I figured it would be best just to go over and plead our case in person. We sit down and are greeted by our server who is pitch perfect throughout the evening--ready with recommendations for wine, brought us samples to make sure it was what we had in mind (2 different ones too!) and told us some of her favorite menu items as well as things that have been popular. She kept up this level of attention the whole night--considering how busy they were, we definitely agreed that her professionalism made a good dining experience great. Our tab for the evening--drum roll please--including 2 bottles of wine--about $200--I'd say, a very good value! I like that they kept the menu fairly simple--they've taken interesting ingredients and accented instead of exaggerated. boudreaulicious wrote: we decided to put our names in around 7:15, knowing that we wanted to come back around 9:00ish and intending to spend the interim at Eno's across the street in the Hotel Intercontinental. At 7:15 they were, indeed, packed. The hostess told me it would be an hour-hour and a half--I said no problem but that we didn't want to try to fight the crowd (no room at the bar or behind it) and would it be ok if we went to Eno's across the street. She looked at her counterpart and shrugged. I said can you take my phone number and call us when it was time to come over. She again looked at her counterpart who shook her head. OK. So I took their number and asked counterpart if I could call around 8:30 and get a yay/nay to come on over. She said OK. Knowing that they are new and obviously slammed, I wasn't going to worry about the less-than-enthusiastic efforts to work with us. Called over at 8:20--said that it would be another hour and half because we weren't there when the table was ready! Obviously less than thrilled now, I figured it would be best just to go over and plead our case in person. It's funny, we had a totally different set of complications when we went: when put our names down, the hostesses told us it'd be about an hour and asked for a cellphone number. I assumed they'd call us when our table was ready, so we asked if it'd be okay to head across the street to Eno, and were told it was a great idea. We lost track of time enjoying wine flights & olives, and next thing we knew it had been an hour and a half later and no one had called. So we went over to PP to check on our table, and were told that it had been ready half an hour prior but we weren't there! Ends up they had actually wanted us to come back in an hour, but had taken my cellphone number with the intention of calling us in case any tables opened up sooner. However, they told us it was no problem, and that they would try to find us seats ASAP. Sure enough, they led us to two open seats at the bar within minutes. I don't know what their original plan was for managing waiting lists & seating people, but it sounds like it may not have been able to keep up with the crush of traffic they've experienced since opening and is now a work in progress. boudreaulicious wrote: We sit down and are greeted by our server who is pitch perfect throughout the evening--ready with recommendations for wine, brought us samples to make sure it was what we had in mind (2 different ones too!) and told us some of her favorite menu items as well as things that have been popular. She kept up this level of attention the whole night--considering how busy they were, we definitely agreed that her professionalism made a good dining experience great. It's good to hear that this seems to be the norm with their staff - our server was excellent as well (as was the manager/owner/whoever the guy was that spoke to us a few times), and made us really look forward to a return visit. That was my first visit to Eno as well--loved it! Great service night for us--our server there, Israel, was terrific. One of the girls left her credit card and he called over to Purple Pig to tell us!! Now that I'm thinking of it, is there a thread for "examples of great service"? If not, I may have to start one! boudreaulicious wrote: Now that I'm thinking of it, is there a thread for "examples of great service"? If not, I may have to start one! Had an outstanding lunch today at The Purple Pig. Whats more exciting, that there is a restaurant in Chicago serving this type of cuisine or that this city can actually support a restaurant that concentrates on snout to tail cooking? Who cares, I am a fan. We cut a wide swath through the menu and tried many of the dishes that have been previously mentioned up thread. Highlights, to me, were the Baccalo Brandade and the Ricotta with Pork Neck Gravy along with the excellent charcuterie sampler. The only thing close to a miss was the pork liver pate which had a nice flavor but didnt really pop for me like the rest of our meal. We split 11 items including the $29 purple pig charcuterie sampler and our meal was a very reasonable $100 split four ways. 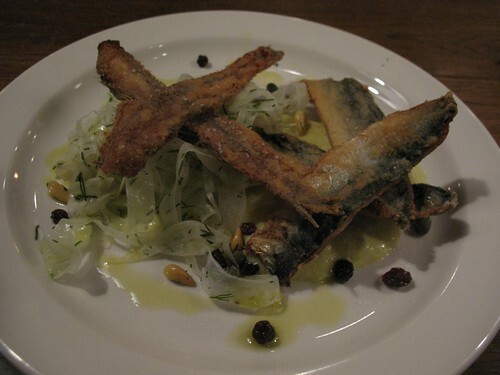 I had a great dinner at the Purple Pig on Friday evening. Regarding the set up and timing, I met a friend there a bit before 6 and we were told there would be an hour wait--it ended up being about a half hour instead. We sat at one of the group tables, which have high bar stools. There are about a dozen regular tables, maybe more. I really liked the group table--by the end of dinner people were sharing food with strangers and we all got a good look at what we didn't eat. The limited seating made me wonder if they'll ever be able to accept, or bother accepting reservations. We shared a number of dishes. The shaved brussel sprouts were my favorite--they were in a sharp dressing, crisp, and acted more as a vehicle for the shaved parmigiana than as a proper vegetable. We also had the beets and squash from the antipasti section of the memo. The squash were tasty, roasted with some fried sage, but maybe a bit salty. The beets were "salt roasted" but I didn't notice a difference in texture or taste from other beet dishes I've had. 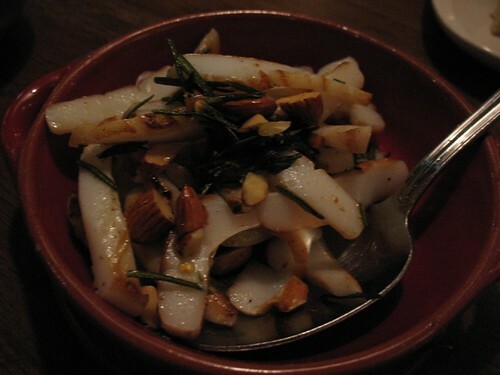 They were served with whipped goat cheese and pistachios which made a nice contrast, rounding it into a salty-sweet dish. We ended the meal with a cheese platter of hard cheeses which our waiter suggested would pair well with our wine--he was right and he was very helpful throughout the meal. 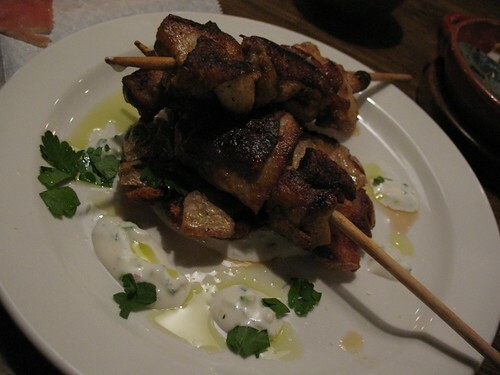 My friend ordered one of the pork smears -- she said she enjoyed it. I eyed the bread; it was the same that they plated with the cheese. It was a real step up from the bread at a lot of Chicago restaurants. It was chewy and had the beautiful floating holes of well developed gluten. I wish they served some without toasting it, but was very good toasted as well. It was a very satisfying dinner. The portion sizes were perfect, certainly large enough, but not so overwhelming that I wouldn't order several dishes to share again. I'm so glad this restaurant opened, especially so near my office. I'll definitely be back but I have a feeling it will be packed for a while. Just got back from my first (of what I predict to be many) visits to The Purple Pig. The awning is now up on Michigan Ave., clear as day, and when we got there for lunch there were already a couple of tables seated. I took a few pictures on my iPhone, but they don't really seem to be worth posting due to low light/crappy camera. If anyone really wants to see them I'll post them. Our party of 4 had only 2 people that wanted to try the "swine" part of "cheese, swine & wine", so we only tried 1 pig dish. It was the one our server recommended. Shaved Brussel Sprouts with Pecorino Noce & Parmigiano reggiano — Like others have mentioned, the cheese is the main player in this dish. But the brussel sprouts are so julienned (think coleslaw) that you'd never know they were brussel sprouts. Salt-roasted Beets with Whipped Goat Cheese & Pistachio Vinaigrette — This was very good. The favorite of 2 of my co-diners. Olive oil-Poached Tuna with Greek Lima Beans — While it wasn't the most visually appealing dish (very beige), it was very refreshing. Nice tuna, great legumes and a nice mid-meal breather. Butternut Squash with Pumpkin Seeds, Brown Butter & Ricotta Salata — Everyone loved this and it was my favorite. Melt in your mouth soft, bursting with flavor, and very light, (like someone said), despite the impression the name gives. Endive and Arugula with Covadonga Bleu Cheese & Orange — eh. Nothing spectacular. Carrot, Avocado & Fennel Salad with Citrus Vinaigrette — If I could duplicate the tiny carrots at home, I'd eat this constantly. Again, light & refreshing. Great lunchtime food. Winter Squash & Goat Cheese Arancini with Sage Pesto — Most arancini I've had are larger, tending to get dry & dull in the middle. These are smaller than a golf ball, come 5 to an order. They're creamy, served piping hot, with just enough pesto on the plate to impart the taste into the arancini, but not enough to overpower. Pig’s Ear with Crispy Kale, Marinated Cherry Peppers & Fried Egg — The most unimpressive of everything served, and I'm a sucker for anything with a fried egg. The pig's ear was chewy and didn't really have any taste other than fried. The egg was served a bit underdone, which is always off-putting to me as well. The crispy kale, however, was delicious. We had also had a nice goat cheese from Indiana that was served with a bourbon jelly spread. I didn't hear what it was when it was ordered, but that was the description we'd gotten. Also of note, attached to the light fixtures over the communal tables are glossaries; explaining a bit about certain meats, cheeses, or preparation. Nice touch. I think Pig Ear, unless consumed directly off a roasted pig, may not be the best part to show off a cook's skill. I had a dish that sounded suspiciously like this at the Bristol and REALLY didn't like it. It was braised then fried, and was gummy, slimy and crispy all at once - and not in a good way There was nothing I'd call meat on it at all, it was just breading over cartilage. leek wrote: it was just breading over cartilage. I'm pretty sure you just summed this up for me perfectly. This was my first experience w/something like pigs ear; I tend to be adventurous in fish/seafood more than meat. When it comes to pig ear, I'm also in the just because you can serve it, doesn't mean you should serve it camp. The tongue at the PP, however, is another story. Fantastic texture and flavor.